Dapatkan Software SuperWinPE2.2 Khas untuk PC Maintenance + Virus Scan yang dibina oleh webmaster EN. TAN. Keterangan lanjut sila hubungi email saya. 1) Boleh guna built-in network drivers untuk ke internet melalui built-in firefox (support flash file) atau IE. 3) Built-in sound (tidak semua pc ), so boleh dengar muzik. 4) Built-in WIFI drivers, So laptop bolehlah terus ke internet. 7) Sistem run guna ramdisk, so, laju. 9) Ada SoftMaker Office 2010 dalamnya. So bolehlah buat word, powerpoint, excel. 10) Software daripada bartpe 1.0 dulu, kebanyakan dimasukkan semula. 11) Boleh install printer drivers untuk print atau lain-lain drivers untuk digunakan semasa run super winpe ini. 12) PC maintenance support - Khas scan virus/malware. Khas untuk PC Maintenance dan boleh guna untuk PC lama, RAM Sokongan hanya perlu 100MB sahaja. Keterangan lanjut sila hubungi email saya. Ifthe actions of malicious programs made it impossible to boot a computerrunning Windows or Unix, reset the affected system for free usingDr.Web LiveCD! Dr.Web LiveCD will not only clean your computerfrom becoming infected and suspicious files, but also to copy sensitiveinformation to removable media or another computer, as well as attemptsto disinfect infected objects. AVGRescue CD - antivirus boot disk for recovery of Windows-systems thatare unable to boot own or have lost this ability due to virus infectionor malicious software. 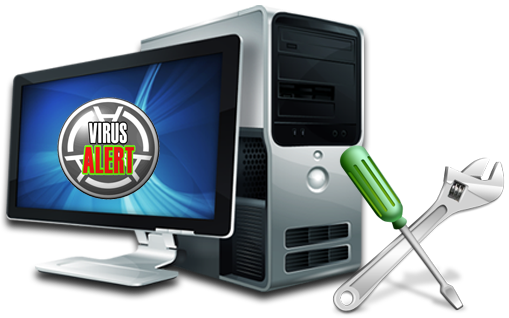 BitDefenderRescue CD scans and removes viruses and other malicious software on allhard drives before the operating system to load Windows. Boot disk forrecovery is used when the system can not be loaded or not workingproperly because the computer is infected with malware. This can happenif the computer was not installed antivirus. - scan for viruses and malicious programs. Panda SafeCD - a boot disk with which you can quickly start your computer and recover the incapacitated operating system. Inaddition, LiveCD ESET NOD32 will guarantee to remove viruses,potentially dangerous files and sophisticated malicious software, whichfailed to neutralize in normal mode. 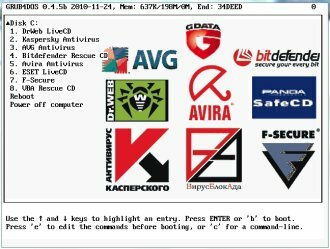 F-SecureRescue CD - antivirus rescue disk based on the operating system Linux,scans your computer and installs the extension. Virus for all filescontaining malware. This product allows youto disarm the malicious (and suspicious) software on the userscomputer with the greatest effect. The scanning and treatment are maderegardless of the operating system installed on your computer. Due tothis, the malware will not be able to counteract the process ofneutralization. KasperskyRescue Disk 10 - Special program designed to scan and disinfectinfected x86 and x64-compatible computers. The program is used when theextent of infection, when it is not possible to cure your computer withantivirus programs or tools of treatment (eg, Kaspersky Virus RemovalTool), running under the operating system. The effectiveness oftreatment is enhanced by the fact that in the system are maliciousprograms do not get control at boot time. While disaster recovery isavailable only to the problem of testing facilities and updatedatabases, as well as roll back updates and statistics. Hiren's BootCD - an indispensable tool used by many computer technicians and system administrators. At one bootable CD assembled dozens of the most popular programs and utilities for running DOS. This is a utility for working with hard drive, its recovery and diagnostic tools diagnosis of all the computer nodes, file managers, utilities for the network, as well as many others. Hiren's BootCD eliminates the need to keep on hand dozens and dozens of disks required in daily work. This version is Restored Edition, means all old programs build back. Keterangan lanjut sila hubungi email saya. Bila order sila berikan product apa yang anda nak beli, dan email kepada saya maklumat anda.